Magali & the Elephants in Yangon Zoo, Myanmar (1994). Elephants to me are huge, sweet and gentle animals. Here in Mumbai we used to see them on the road along with their mahouts who used them to beg for money and food. Normally they do not harm anybody but there are some instances where they have gone on a rampage and killed people (mostly due to ill treatment) Now they are banned on the roads in Mumbai but can be seen on the outskirts of the city. 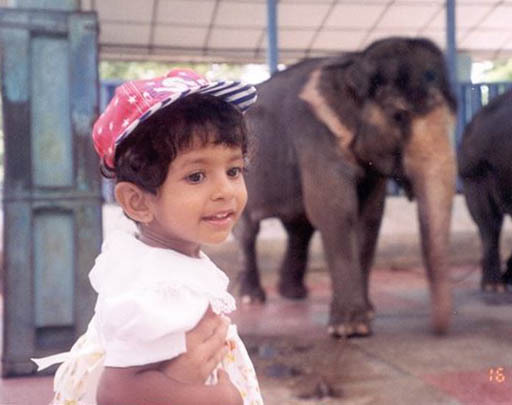 Since Magali was just one year old we had been regularly taking her to the zoo in different countries. 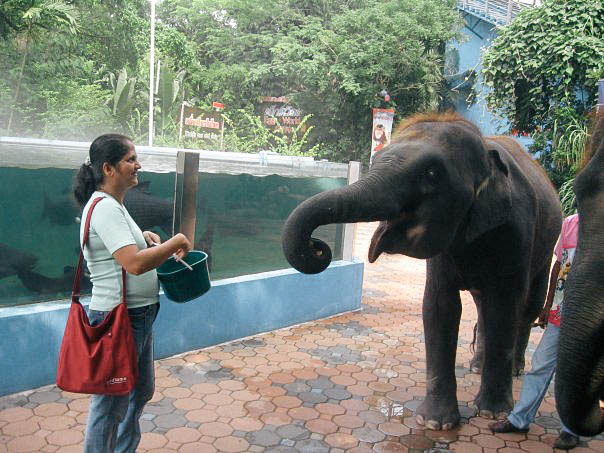 Here in Mumbai we are not allowed to feed the animals but I remember when we visited the zoo in Yangon, Myanmar we had to pay a certain amount of money and we were given a small plastic basket filled with sugar cane. Magali and I enjoyed feeding the elephants. 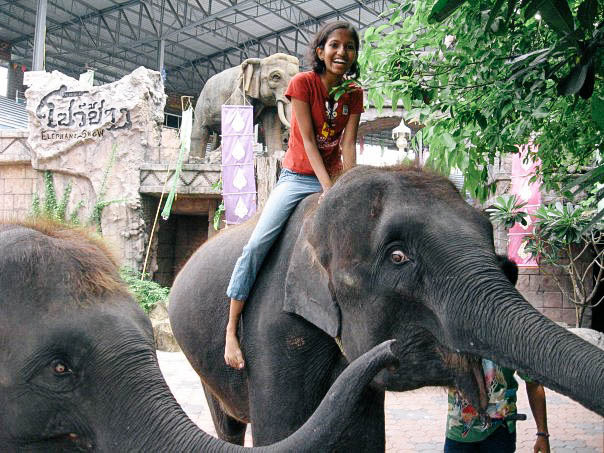 About five years ago the whole family went on a holiday to Bangkok where there are a lot of elephants at the zoo and different places we visited during our stay. Magali even sat on an elephant for a fee where the trainer was taking the elephant around the area for the ride. There too we could feed a lot of elephants with sugar cane and they would nicely take it from your hand. 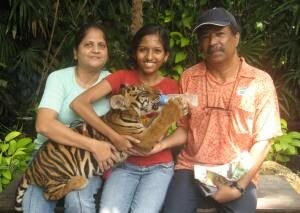 Magali (above) & me in Safari World, Bangkok (2009). Poachers should leave the elephants alone who they kill for the ivory. Ivory is banned in India and many other countries so I hope the elephants can live a longer life now. This post has been written as part of ABC Wednesday. I absolutely adore elephants they are by far my favourite wild animals, You're right in saying how elegant they are and they have such human eyes...I think I was an elephant in a previous life! team. I almost wrote about Elephant's but I was so pleased to read about your elephants. I love elephants too ! They are so special creatures. Your photos are beautiful ! Elephants are indeed majestic - so huge yet so peaceful. Elephants are cool! And wise.